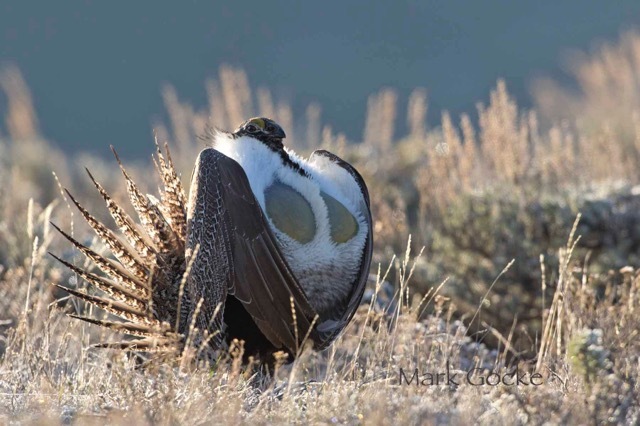 The Greater sage-grouse is an iconic western bird whos status and population health will have lasting effects for wildlife management and energy development in Wyoming. Throughout the last ten years the state of Wyoming along with a myriad of diverse stakeholders have been working to manage this chicken-sized bird to reduce its rate of population decline. Effort has been focused to protect its core living space and structure development to minimize disturbance to that living space. The Governor’s Sage-Grouse Implementation Team developed such management parameters and that is now an Executive Order under Wyoming’s Governor Matthew H. Mead. Statewide we have a strong plan for keeping this iconic bird – the Greater sage-grouse – alive and well into the future. However, in Wyoming where almost half of our land is owned and managed by the federal government, the Bureau of Land Management (BLM) and the United States Forest Service (USFS) they have their own idea and vision for how to manage the land and indirectly the bird. The federal government recently, as of May 4th released their vision for managing the greater sage-grouse on their public lands. The public has an opportunity to comment on that vision until August 2, 2018. Oil and gas drilling should be prioritized outside of both general and priority habitat management areas. The federal/Bureau of Land Management plan suggests prioritizing outside of just the priority habitat, but science shows the need for general habitat to be protected as well. Greater sage-grouse habitat crosses state borders. The BLM needs to account for how their management vision will impact the grouse in the aggregate and thus needs to work with the federal Sage-Grouse Task Force (SGTF) to ensure that cross-border issues are accounted for. The State of Wyoming is represented on this task force. The Federation accepts the change to remove Sagebrush Focal Areas (SFA). These areas focused on hard rock mining. The Federation is supportive of maintaining “no surface occupancy stipulations” (NSO) in order to protect the priority habitat management areas (PHMA) – the most valuable habitats. The disturbance caps for how much sage-grouse habitat can be disturbed was maintained in the federal plans. This is important for managing impacts from various activities. When a development is being planned, harm to the wildlife or habitat is reduced through mitigation – avoidance, minimization, and then compensatory mitigation. The federal plan is set up to adopt the State of Wyoming Greater sage-grouse Compensatory Mitigation Framework. Because the mitigation hierarchy (avoidance, minimization, and compensatory mitigation) was maintained the no net loss of habitat is ensured. A management plan that is fluid and that can be altered as habitat improves is vital. Therefore, we support the Adaptive Management Working Group who is tasked with creating a process for reviewing/reversing actions in response to improved habitat conditions. Leks are traditional places male sage-grouse assemble during the mating season to attract the females. In the federal plans, the leks have a buffer of limited development to safeguard the leks, a measure in which we support.